Replies: 26 (Who? ), Viewed: 12103 times. #1 13th Jun 2018 at 5:13 PM Last edited by Sunrader : 20th Jan 2019 at 2:50 PM. I don't consider myself qualified to write a tutorial but I wanted to share this new thing I learned. Mods will decide if it doesn't belong here, but I think of it as just a suggestion for more fun world building and game play. I may be late to the party on this, but, hey, with a game this old, the party never ends, right? I only just figured this out and I hadn't seen it talked about. 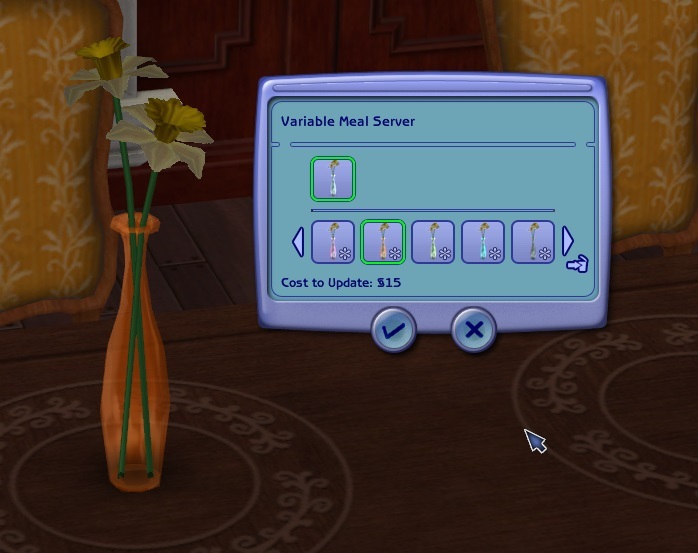 In fact, I've seen a lot of talk about trying to hide the batbox under the stairs or recolor the brightly colored meeting caller or getting tired of seeing the philodendron or hydrangea on every lot, so... if you want to change the model for the essential mods we all know and love, it's easy to do in SimPE. Obviously back up objects in some reliable way before you work on them. Look for an entry like 3D Object Names or Model Names or Object-Model Names. You can find it in the overall list under AllRes or under Text Lists (STR#). EDIT: Clsve pointed out that it's always going to be instance 85. Thanks! 2) You will change the string as shown in the image. Commit and save. That's it, if the object only has one version. 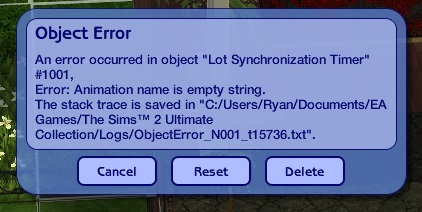 I get the name of the maxis object I want to use as a model by cloning a maxis object and looking for the model filename, then I don't save that clone. I haven't figured out how to find the name without cloning and looking so more experienced people can please jump in to share easier ways. I also haven't found an easy way to use a custom object or a Maxis recolor and I'd be interested to know more, again from those people who've been at the party longer. For Need Freak and others with a menu, you need to change the model names as above, but you also want to change the menu so you know what to pick. These are also found under Text Lists (STR#) but BO didn't give his a name other than the default [Text Lists] so not sure what others might call it. Just click through till you find the menu one and change there. Commit and save. In the game, I generally had to rebuy an object to change its model and some of them do need moveobjects to place well. It seems to me that if I have options set on the old model, when I buy a new one before deleting the old, the settings transfer over. Additionally, it's really nice that the latest model used shows up in the catalog so you can easily identify the mod by the way you see it your game. I'm enjoying exploring Maxis models to find more specific ones that work for my lots, so would love to hear others' suggestions/ideas/corrections/etc. EDIT: Scroll down to #24 to see what to do if there is no Text list instance 85. By using a Maxis model you can remove the Mesh-related files (GMDC,GMND,CRES,SHPE,TXMT,TXTR,MMAT) from your package. #3 13th Jun 2018 at 9:30 PM Last edited by Sunrader : 19th Jan 2019 at 3:47 PM. Good idea, if you won't want to go back to the original. EDIT: I used BOs Need Freak to test, not all of them, but all the types, and there were no issues. It's fun to see a big pile of trash as a useful mod. Humbler Humble at home. The trash pile is BO's Need Freak. #5 13th Jun 2018 at 9:53 PM Last edited by Sunrader : 14th Jun 2018 at 12:00 AM. Oooo, please do share any tips you have for us! I'm just feeling my way. So I've been trying this out and I've had some successes and failures. The Batbox - converted it nicely to a stack of canvasses, no problems. Neder's Variable Meal Servings - Changed it to pick up the base game bud vase instead of the cloned object, and it picks up the installed default replacement mesh and recolours perfectly (see screenshot). ACR 2.0 - I tried replacing one of the ACR Adjuster models to a vase of flowers and every time I changed the adjuster model to that in game it would simply vanish. I don't mind that much cos ACR has reasonable meshes, but I would like to be able to tweak them to something slightly more my liking. Lot Sync Timer - I have a mesh replacement by Shastakiss that I've been using, but it throws an error every time you pull it out of the catalog so I thought I'd try changing it myself. Same error happens. Any thoughts on how to prevent this error? Error: Animation name is empty string. Looks like I have to try it with christianlove's hacked objects. What about elecronics like TVs and computers? Is it harder? #8 14th Jun 2018 at 1:00 AM Last edited by Sunrader : 14th Jun 2018 at 1:25 AM. Maybe try this again. I have never used this Timer, but I downloaded it, opened in SimPE, changed the model to a big pile of trash, saved, closed, and tried it in game in a new test hood with only Humbler Humble for company. No problem. I have to use moveobjects to place it, but it shows up in game and in the catalog as trash, and the menus appear to work. I don't know what the object does, but it doesn't show any errors for me in UC. EDIT: @kidhedera, I also tried it with ACR. Again, no problem. I made the second model a pile of trash and it spawned as the phone books, then I changed the model and there's a pile of trash. Humble is living in a big pile of trash now, but no other issues. Could you be changing the wrong thing? Did you open the ACR - Controller - Main package? As far as I can tell, all the models are the same. You just have to find the model name you want, but this is just for objects that you only click on and get a menu for, basically, objects that act like a painting with a menu. Is there a way to have it also be able to use the recolours of the parent object? That would be nice. #11 14th Jun 2018 at 1:09 AM Last edited by Sunrader : 14th Jun 2018 at 1:55 AM. I was wondering how to get the other colors of the jukebox, not the default red, but no one has answered my question. Is that what you mean or something else? I always clone an object if I want to work out the internal references - I generally find that much quicker than searching the objects package. You have to remember to untick all the options on the clone panel - that tells SimPE you want to extract the original not make a new thing. At least that's what I was told anyway. Personally though I don't want to change the appearance of the batbox - not that I like it particularly but I want to be able to find it easily rather than try to remember what I changed it to. It's bad enough with the sim blender. #14 14th Jun 2018 at 1:39 AM Last edited by Sunrader : 14th Jun 2018 at 4:08 AM. Is there a way to clone an object without finding it in the objects package, anyway? That would be nice. I don't bother to uncheck stuff because I'm not really going to use the clone. I'm just looking for the model name it uses. The batbox was just an obvious one to mention so people know what I mean and a good one to test. I actually started with the giant red Soviet hammer and sickle, because, well, it didn't match my decorating scheme. I don't really mind batbox because I don't leave it on my lots, anyway. If you don't it can change some of the other internal references when you clone. I just find it fairly simple to look through the list in Object Workshop to find stuff because I've been doing it so long I can remember where most things are. Not everything is in the list of course. The batbox was just an obvious one to mention so people know what I mean and a good one to test. I actually started with the hammer and sickle, because, well, it didn't match my decorating scheme. I don't really mind batbox because I don't leave it on my lots, anyway. Hammer and sickle? Is that macrotastics? I can't remember - I stopped using that a good while back. edit - oh wait, Business Uses You? Don't use that one either. #16 14th Jun 2018 at 2:00 AM Last edited by Sunrader : 14th Jun 2018 at 3:17 AM. I was trying it out. That's what inspired me to figure this out. My big ones right now are Need Freak and Meeting Caller as I try to make autonomous community lots. I need them available and right at the front of the lot so I wanted objects that blend into my lots but aren't all plants. I have another idea to make the painting that cures zombiism (Sim Transformer?) into a fountain they have to visit by changing the sculpture in the center of it. That'll be fun. There are so many ways to play. I'm sure some people don't have any objects they'd prefer to change. I tried again with both and no problem this time. Not sure what the problem was? Maybe I typo'd something somewhere. Definitely. Thanks for the tutorial, its surprisingly simple to do! I thought it would be much more difficult. That is a lot of computers. What about....okay so if anyone has ever used InSim, one of the options in "Change Model" allows you to change it to a custom painting (meaning you actually get to choose the painting from whatever .jpgs you have in your Paintings folder). How did they do that? I'd like to be able to do the same with the Batbox and the NeedFreak. Ooh, thanks so much for this! There are a couple of objects I'd love to whip a quick make-over on, and this looks like exactly the thing. I quit burying my batbox a long time ago by cloning and recolouring. Mine is now silver-grey with a fan and grille on top so it looks acceptably like an air conditioning unit when placed next to the house. I wouldn't put my recolour up for download or change the coding (as if I could), but for personal use? I love my batconditioner. I had the same issue as kidhedera with Shastakiss' replacement. Doing it myself worked like a charm. #24 19th Jan 2019 at 2:09 PM Last edited by Sunrader : 19th Jan 2019 at 3:45 PM. I want to add a little update here. On the @TheJessaChannel part of the recent Livesimming Train, Jessa said she'd be interested in this tutorial and in an older video I just watched, she mentioned not being able to change the model for the Semester Tester (https://www.youtube.com/watch?v=7WYMmqcHcyU). I, too, want to play uni in the base hood, so decided to fix that, and have also added it here as it's a little additional info for people who want to change their own models. I learned a lot about uni in base hood from reading posts by @joandsarah77 and @lauratje86, too, so, if they still play that way, they, too, may be interested in this. The Semester Tester is the giant apple sculpture and you need one for each student, so it's a natural choice for this change. 1) Use the Simantics Resource Finder to find which objects.package the Semester Tester is in, Pets. 5) Find the 3DModels Text List instance 85 thingy in the filtered resource list. 6) Right click the 3DModels to extract and save it. 8) Right click in the Resource List to ADD the thingy you just saved to the mod. 9) Find something more suitable than an apple sculpture (as above). 10) Change model name (as above). For this quick demo, I used an obvious choice for a college going mod, the sculpturebookstack. But, if I were using this a lot in my own game, I'd probable prefer something more interesting or I might make a couple of different versions, so I could use a different model for a humanities than a science student maybe. I could add more things to the mod and change the object placement, so that I could use books that go on a shelf, for instance. (Since the apple goes on the ground, so will anything you choose this way.) If I were going to that much trouble, though, I would probably go ahead and figure out how to add choices of models. If I do that, I'll update, but for now, we have a version of Larky's mod that has a book stack as the model instead of the giant apple sculpture that can also be changed easily with our original method. EDIT: I would share it here so it can be used as a demo file, but, there's no sharing of CC here, so if anyone wants it, I'm happy to send the link PM. There is no sharing of cc here.